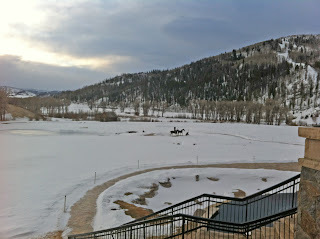 All good things have to come to an end and I have to say my trip to The Lodge and Spa at Three Forks Ranch was all good. I had brought my friend Lynn along and we took full advantage of the unlimited spa, food, drinks and activities this place offers guests. After we had an early breakfast, Jenn Brenneman, the lodge manager, met us to take us on a full tour of the lodge. We started with a little history about how David Pratt purchased this land in 1999, combining six ranches because he wanted a big cattle ranch. He also acquired 25 miles of Little Snake River and undertook the largest river restoration in the United States. The area – partly in Colorado and the rest in Wyoming – offered some of the best trout fishing in the world and he started a fishing lodge here. Soon he needed more room and the lodge we were staying in was built, complete with 15 guest rooms for a total of 35,000 square feet. Every detail had been carefully constructed, from the wood coming from London that was hand carved to the Charlie Russell sculptures. 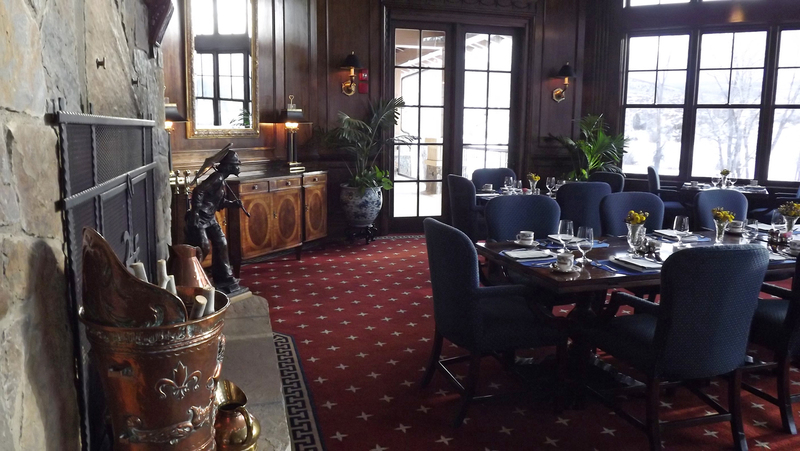 We took a good look at the breakfast and main dining rooms, which always felt elegant and we received fantastic service in both. 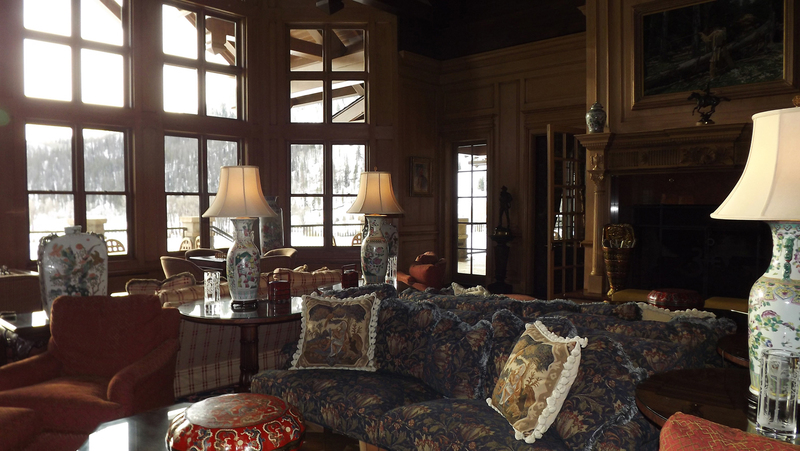 There was also a wine room used for wine pairing dinners and small groups that wanted privacy when the lodge was full. As we walked past the entry way, I remarked how was always filled with one of my favorite flowers, gladiolas, welcoming you into a living room filled with priceless art that still felt inviting and comfortable. One of our favorite pieces in the lodge was the Steinway piano (the only known signed one of this model), which was set up to play itself while an adorable stuffed bear sat on it. We would hear that music every night as we enjoyed cocktails by the bar. That bar room was always a conversation piece in itself, starting with the huge mural behind the bar by Wayne Cooper that depicted what the area may have looked like long ago around the Three Forks River. It was one of many different pieces of art throughout the building that included vases and platters from the Ming Dynasty. 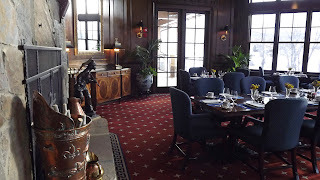 There was a conference room that Jenn told us was used by corporation and groups who booked the whole lodge for a stay. We took a quick stop at the fitness center before we headed down the stairs to look at some of the other room types. 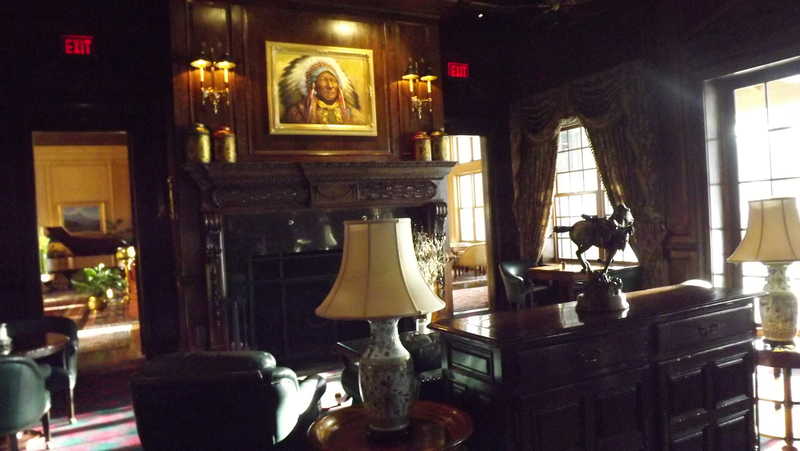 The library suite was lovely, with an antique secretary that reminded me of the one my grandfather used to have. Before we left we took a final look at our beloved spa. 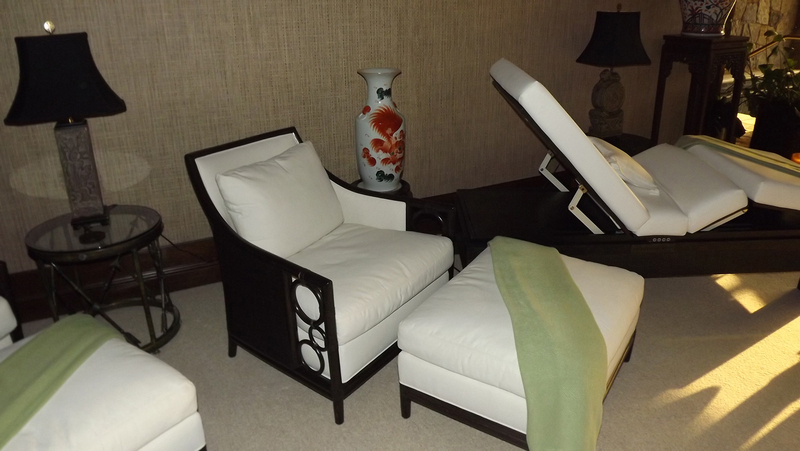 It had been the center point of our visit and had brought us so much relaxation during all the treatments that are included for every guests stay. For me, spas have always brought a tranquility that I can’t get anywhere else and there was something about looking out at this huge ranch that just made it that more peaceful (and the massages, wraps and scrubs were fantastic). 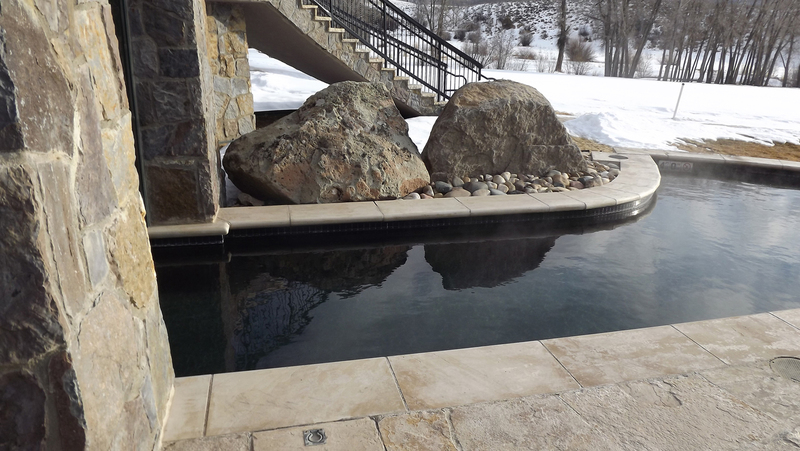 Although I did not venture out this trip, I could imagine how wonderful the indoor/outdoor pool would be in the summer. It was time to head out and Jenn took us through the snow caped mountains. As we got closer to Steamboat Springs, my cell phone started buzzing with messages. It had been a unique, feeling to not have service for four days, but I think I had really enjoyed it. 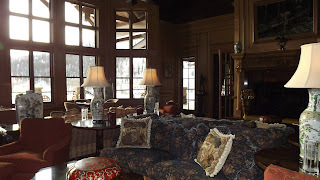 I was far from cut off since Three Forks Ranch not only provides guests with wireless internet but also their own IPads. It was back to full civilization for Lynn and me, though, but I have a feeling that I will be back on the ranch again someday. 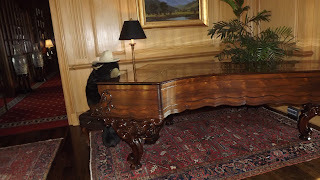 Hello, I am the piano rebuilder who restored the vintage Steinway Grand Piano you reference in this blog. It is very encouraging to know that the piano has brought joy to so many people! - Dennis Chupp , Chupp's Piano Service, Inc.